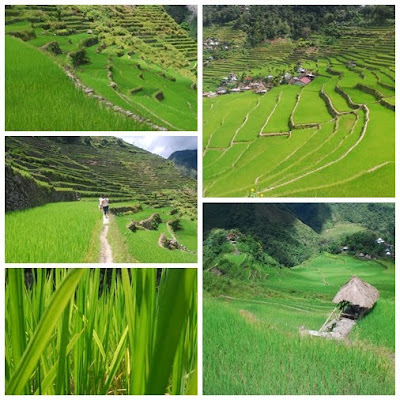 We were only supposed to go to Sagada, however we took the Auto Bus route from Manila to Banaue one Friday night last month (May) we decided to make the trip more worthwhile by taking a side trip to Batad Rice Terraces and Tappia Falls. 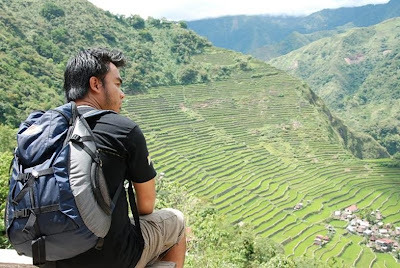 Prior to this, I’ve never been to the world famous rice terraces and I was glad that this time, I was able to do so. 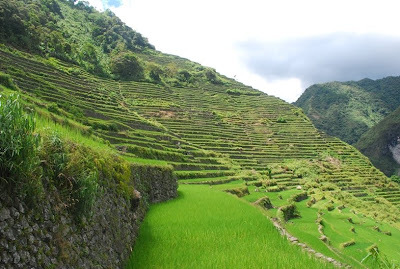 After a gruelling 12 hour bus ride from Manila in an aging Auto Bus which rendered its air conditioned useless an hour after leaving the terminal, we arrived at Banaue about 9:00 the next morning. 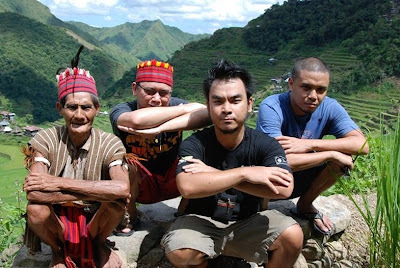 We rented a van that took us to the jump off of a short trek (which according to our guide will only take an hour), the van was good for 1,500 and it would be much cheaper if you’re a party of 8 to 10 people, we were 5 in our group, so do the math we split everything five ways. 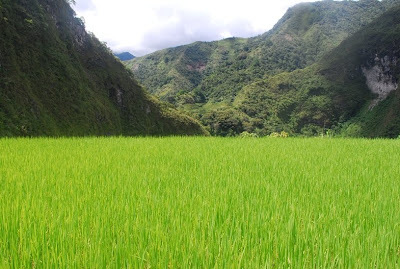 We never reached the jump off or the saddle because a certain part of the road became impassable due to landslides, so we started our hike much earlier than we planned. It took us 30 minutes to reach the saddle and from there on, we starte d yet another hour of hiking. 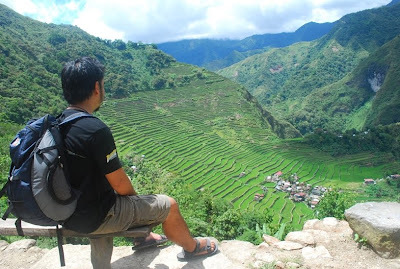 Then our guide, chewing on a “*nga-nga” told us “another ho ur” of hiking is needed to reach our destination, Tappia Fall s.
The short hike gets very tiring (in my current physical condition hehe) but the view along the way makes up for it. 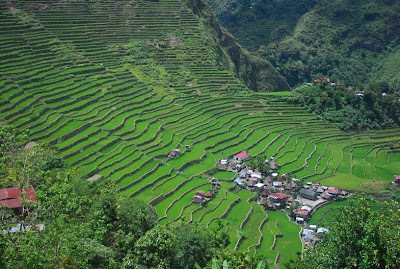 You can’t help it but take time out to marvel and gaze at the sight of the rice terraces, like amphitheater that stretches up to the sky filled with lush green rice fields along with small villages in between. In all, we hiked a total of two hours before we finally arrived at Tappia Falls, there were half a dozen rest stop along the way where locals sells gatorade and softdrinks, 50 pesos at the viewing deck then it becomes 70 pesos near Tappia Falls (understandably, it gets harder to bring things there) we took a swim for about 30 minutes, enjoying the cold water, lying down on sauna like pool formation therefore applying cold water therapy on our aching feet and leg muscles. 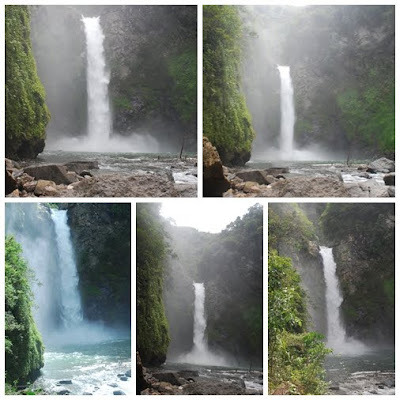 After almost an hour’s stay at Tappia falls, we hiked back to the viewing deck where we had our late lunch (almost 4:00 pm in the afternoon), we were so tired I could swear its the best “sinigang na baboy” I’ve ever had. Can’t tell the same thing about the Chicken curry though . We started our hike back again at about 5:00 PM, reached the saddle at about 6:00 PM, and hiked back again to where our van got stranded by the landslide and as Don said, we reached our van just as total darkness was about to take a bite. (with matching palm motion of biting). 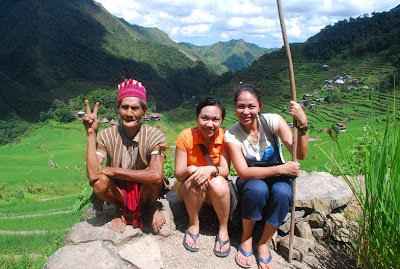 We had dinner back at Banaue then drove off for Sagada for three hours before we finally called it a day.